This afternoon some members of the River City staff spent a couple of hours with urban leaders from across the country. They are all part of the doctoral program at Fuller Seminary, and are in Chicago for a 1-week, intensive class with Dr. Soong Chan Rah. 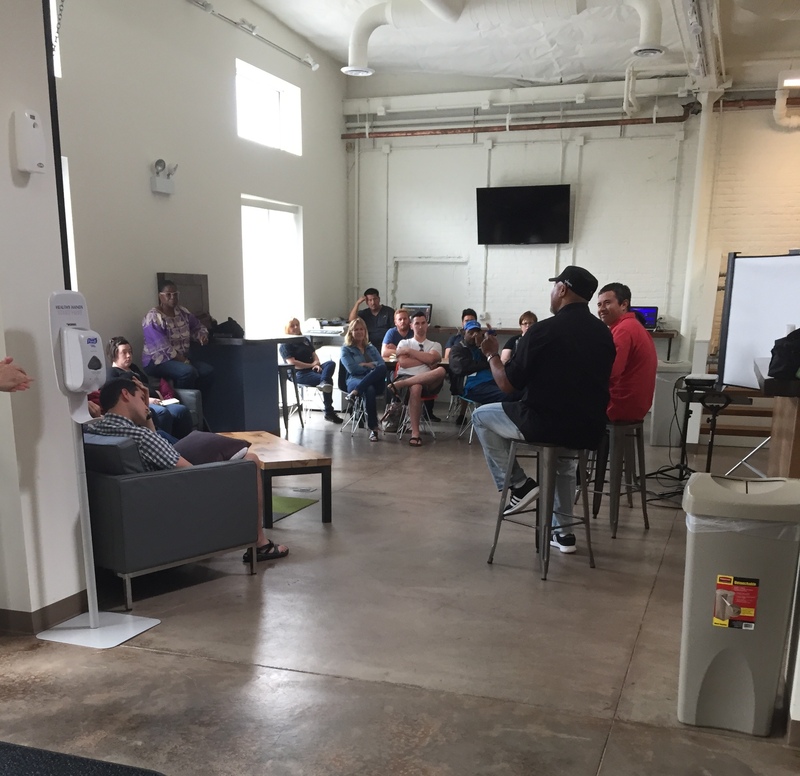 We had a really spirited discussion, and I really enjoyed listening to Antoine Taylor, Carlos Ruiz, and Brandon Green share their insights about what we are learning at River City (we have female leaders too! These three were the only ones available today). Great leaders tackle Great problems — Though there are many challenges that come up with urban ministry, our conversations immediately gravitated to issues of justice and reconciliation. This comes as little surprise, as these represent the arenas with which our society most greatly struggles right now. As the conversation unfolded, I kept thinking of a quote I heard from Dr. John Perkins years ago: “The greatest leaders in each generation are the ones that are going to follow Christ into the greatest challenges of their generation.” Our conversation clearly had more questions than answers, but I felt a deep sense of affirmation for the good work that each person in that room was doing. They know that our society is being ripped apart by historic and systemic injustice, and they want to be used by God to take the challenge head on. The critical presence of the “Big C” church — There are few truths from Scripture that are more mystical to me than the reality of Jesus referring to the Church as his “Body.” Everything that Jesus was in human form – a healer, reconciler, teacher, preacher, liberator – is now carried out by the “Body” of Christ. The Church is literally the extension of his work and person. It was so encouraging to spend time with men and women who represent the Body of Christ in different parts of the country. In just the short time this afternoon I got to have deep conversations with Rev. Laura Truax (LaSalle Street Church, Chicago), Rev. Kevin Blue (Church of the Redeemer, LA), and Rev. Abe Cho (Redeemer Prebyterian Church, NY). I met others doing amazing work in forgotten places around the country. Stuff like that does my heart good – it reminds that while there is great darkness in our land, there are is also great light penetrating on behalf of the cause of Christ. My gratitude to work with such a potent team of leaders — It’s a surreal experience when the smartest people in the room are the ones that you work with everyday (no offense to the others in attendance!) It caused me to feel incredibly grateful for the opportunity to work alongside such a fantastic team of staff and elders. I’ve learned more from the intense conversations of exploring the kingdom of God with them than anything else I’ve ever done in life. It’s something I wish for in the life of every other person I know that is serious about growing in their walk with God. There is no substitute for reciprocal friendships with folks who have experienced the realm of this world from different social locations, and who are seeking to pursue Christ and his kingdom given that set of experiences. It’s certainly played a huge role in me becoming the person I am today.